***NEW Two days in Mexico City! This visit will include a private tour of Casa Azul (Frida Kahlo’s home) and the Museo Diego Rivera. Our lovely hotel is right on the main square, a very safe area hosting the magnificent cathedral, the national palace and many museums. ***Early Bird Special! Book by October 31 and save $100. Join us for a wonderful painting holiday in this lovely historic town located in the heartland of old Spanish Mexico. 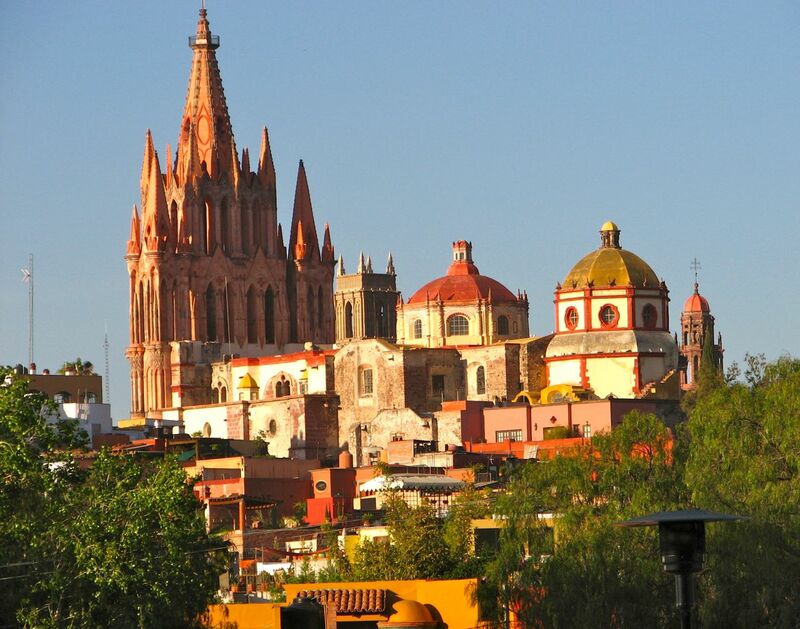 San Miguel de Allende is very safe, friendly and welcoming with wonderful restaurants and warm, sunny weather. The bright colours, colonial architecture and lush parks and gardens offer stimulating subject matter that attracts artists from all over the world. Take a look at some photos from previous workshops. Our previous visits were very successful and many participants keep coming back. Our workshop focuses on watercolour painting, pen and ink sketching and pen drawing with wash. This workshop is for participants with some previous experience in their chosen medium. Participants working in other media are very welcome, as are non-painting partners and friends. Demonstrations, individual attention and constructive critiques are essential elements of this creative learning experience. Click here to see What To Expect from a Barry Coombs painting holiday. A graduate of the Ontario College of Art, Barry Coombs has led painting holidays in Quebec and Maritime Canada for over twenty-five years as well as many international workshops in England, Italy, France, Greece and Mexico. He is noted for his positive and constructive attitude and ability to work with students of all levels of skill and experience. Barry exhibits his work locally and internationally and represented Canada at the G20 World Artist Festival in Seoul, South Korea in 2010. He is represented by Gallery on the Bay in Hamilton, Ontario. Click here for photos of past San Miguel de Allende painting holidays. ***All prices are based on a minimum group size of 12 participants. If the minimum group size is not attained an additional supplement may apply. Participants will be advised at time of final payment. 1) Contact Barry Coombs using the form below or at barryfcoombs@gmail.com to reserve your spot on a first-come, first-serve basis and to receive a registration number. Transat Travel will not enroll you without a registration number. 2) Call our Transat Travel agent after I provide you with a registration number and his contact information. 3) Pay non-refundable $500 travel package deposit to Transat Travel; due immediately. The purchase of travel/cancellation insurance is also highly recommended and payable at time of deposit. 4) Pay travel package balance to Transat Travel; due January 7, 2019. The balance is non-refundable unless you have purchased cancellation insurance.